The tube map may be facing a new threat south of the river. All the signs are there. If you've been on an Overground train recently, you may have seen a new set of line diagrams in the carriages. The ghastly Overground spaghetti map is still there, above the doors, but that's now been joined by proper maps showing each individual line. These are plastered in the spaces above the windows, and look just like the line diagrams you'd normally see in an underground carriage. They first appeared last year on the newest bits of the Overground, out to Cheshunt, Enfield and Chingford, but only now are they being rolled out to the earlier lines. Here, for example, is the line diagram for the East London line (you can click to zoom in). This runs from Highbury and Islington through the Thames Tunnel before branching to Croydon, Clapham and Crystal Palace. It clearly shows all the zones the train runs through, including the annoying dip into Zone 1 for Shoreditch High Street. It's hugely easier to understand and follow than the tangle above the doors. Indeed you might think it's amazing these diagrams haven't been available for passengers on trains before. There is a catch. Overground rolling stock isn't always restricted to individual routes, it runs interchangeably on certain lines, in which case TfL can't predict which one. So each carriage contains not one nor two but three different line diagrams, a different one above each window, repeated in sequence down the train. You might be lucky enough to be sitting opposite the line you're on, for easy scrutiny of your journey, or you might not be able to see where you're going at all. It's a big improvement, but it's not ideal. Plus of course the lines still have impractically long-winded names. One map is labelled the Watford Junction to Euston line. Another is the Richmond/Clapham Junction to Stratford line. And the third is the Highbury & Islington to West Croydon/Clapham Junction line. They're not catchy names, nobody outside TfL's branding department calls them this, and the lengthy titles mean the font size has to be small so the maps aren't readily identifiable. But none of this is the new threat I referred to earlier. Did you spot it on the map? Someone's added Battersea Park to the Overground diagram. And they're not kidding when they say 'limited service'. Battersea Park is the most insignificant station on the London Overground, even less important than that dormant halt between Romford and Upminster. Battersea Park sees no more than three Overground trains a day, two out and one in. They run at wildly impractical times, making it highly unlikely you'll ever catch one. And the weekend service is almost non-existent, comprising a single early morning train on Sunday and nothing else. I mean, look at this. These scheduled diversionary trains have been running for a few years, but only now has some stickler for the rules decided that Battersea Park must appear on the Overground map. It's hard to understand why. All the trains in the first column start at Battersea Park, then join the normal railway, so you'd only find the line diagram useful if you'd deliberately gone to Battersea Park, in which case you must already know what you're doing. It's only in the reverse direction where the diagram might actually help. If you turn up to board the 2221 from Dalston Junction somewhere along its route then you might wonder where the hell this mysterious destination of Battersea Park actually is, and the updated line diagram would tell you. But if you catch any of the other fourteen hundred southbound trains per week, then the updated line diagram is nothing but an irrelevant distraction. And it's not just on the line diagrams on the trains. Battersea Park has also snuck onto the official Overground map, which you'll find in the middle of the printed timetable or on the TfL website. A dotted orange line now branches off after Wandsworth Road, seemingly close to Clapham Junction, but in reality nowhere near. Nobody needs to see this irrelevant spur on the map, nobody other than a Battersea commuter who leaves home before breakfast and gets home at midnight. But there it is, illuminating a minuscule fraction of Overground journeys while adding confusion to the rest. So to return to that threat I mentioned earlier, what if the tube map is next? If Battersea Park's been quietly rolled out on line diagrams and the Overground network map, what's to stop it appearing on the next iteration of the tube map proper? What if someone on some design committee has decreed that TfL's complete service should appear, and this means squeezing in a station with barely any TfL trains at all? What if Battersea Park is lined up for inclusion simply 'to comply with the rules', and not because it'd be in any way helpful? There is precedent for this. The District line to Kensington (Olympia) is pretty much irrelevant on a weekday, but it still appears on the tube map. Admittedly it runs as normal at the weekend, and admittedly it used to be important until TfL deliberately ran the service down, but it is an existing example of a limited service appearing in full public view. But there's also precedent for diagrammatically ignoring limited services. For example, every day a tiny handful of Metropolitan line trains shuttle between Rickmansworth and Watford via the Croxley North Curve and the Underground's least used tunnel. 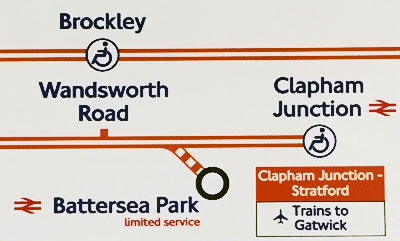 These rare services are very similar in number and inconvenience to the Overground's Battersea Park service - but Croxley's curve never appears on any diagram or map. If Battersea Park is the future, then by rights Croxley should start appearing too, because what's the point in having a pedantic rule if you don't stick to it? And Battersea Park could well be the future, because by the end of the decade Battersea Power Station will be on the tube map, so maybe the plan is to showcase the Battersea area a few years early. But hopefully Battersea Park isn't the future, a pointless stump disfiguring a once comprehensible diagram. It may never happen. Let us never mention it again.